Cane Toad’s scientific name is Bufo marinus. Usually they live throughout South America, northern Australia and parts of the Caribbean. The cane toad is very large; The average size is 10-15 cm(3.9–5.9 in), but the largest recorded specimen is 38 cm(15 in) and over 2 kg(4.4 lb). Poison glands on the toad’s shoulders kill many native animals that feed on amphibians, inculding snakes, goannas, carnivorous marsupias and birds. behind the head. This poison can kill the lizard at once, so if you have a pet dog, you should be really careful. They have a very high reproduction rate; females lay 35,000 eggs at a time. They have a life expectancy of 10 to 15 years in the wild, and can live considerably longer in captivity, with one specimen reportedly surviving for 35 years. 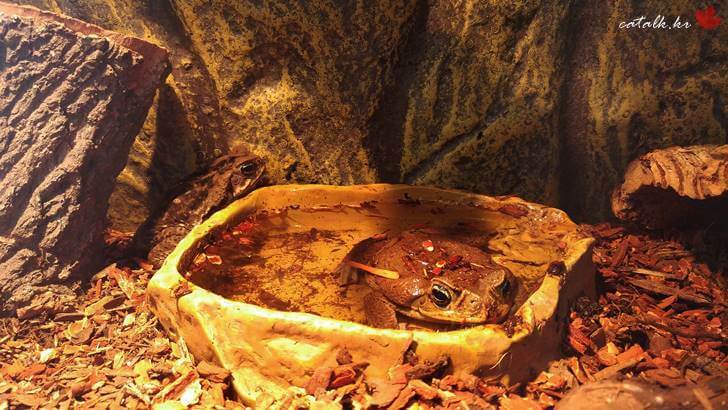 Cane Toads have been introduced in many countries across the globe because of their ability to eat pests. In many of these countries they are now considered pests themselves due to a lack of predators, and because their huge reproductive rate allows them to populate vast areas in only a few years.